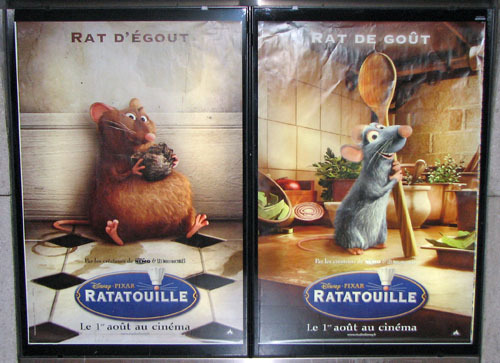 In the waning days of June, as Joe and I frantically prepared for our move to Paris, there was one thing on our list that we did not get done: we didn’t see the movie Ratatouille when it first came out on June 29th. It didn’t seem like a major problem at the time, but as rave reviews came pouring in for the movie, I got more and more eager to see it for myself. The problem was that even though the movie is set in Paris, it didn’t open at the same time as it did in the US, and we didn’t know when it would arrive in theaters here. I had heard about advance screenings taking place, but it wasn’t until a few weeks ago that the first posters announcing the movie started appearing in our local Métro station. We finally had a date to look forward to: August 1st! Seeing these posters in the Métro was a daily reminder of what we had to look forward to, but as a lover of word play, I also found the posters themselves entertaining. They featured the main character, Rémy, in one panel, and his slightly clueless brother, Émile, in the other. Over Émile’s head ran the phrase “Rat d’Égout” (“Sewer Rat”), and over Rémy it said “Rat de Goût” (“Rat with taste”). After enduring nearly a month of waiting, it was with great anticipation that we went to see Ratatouille on its opening night. The theater was packed, and I wondered how all the native Parisians around me would react to seeing their city up on the big screen in animated form. The difference between seeing the movie in the US and France was apparent immediately. The first few scenes involved someone speaking French, and we presumed in the US version there were English subtitles, but what we saw were French subtitles of the French dialogue! And what was even more strange, the text and the movie dialogue were quite different. I don’t want to spoil the movie for those who haven’t seen it, but I’ll just say that it more than lived up to its promise, and it’s a movie I would see again and again. It was especially fun for us when we could recognize a certain part of the city, and in one particular scene, both of us gasped in amazement at how true to life the movie was. Only a few days prior to seeing the movie, we had run across a most unusual window display in the Les Halles district of central Paris, and this exact window display showed up in the movie! Les Halles was formerly the site of an enormous food market, once known as the “stomach of Paris,” and it naturally drew not only hungry humans, but non-human visitors as well. 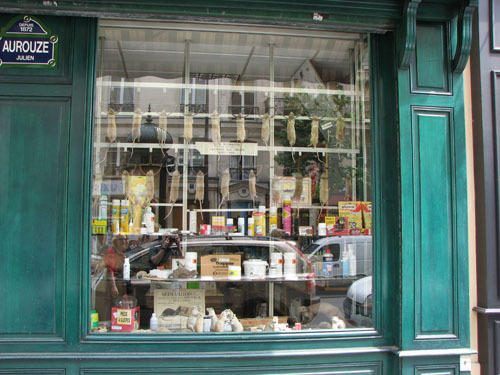 Maison Aurouze, a long-established extermination company that once trapped the rats in the market district, now displays their mummified corpses in its front window, along with other stuffed creatures in various creepy poses. It definitely made an impression on us when we first saw it, and it was strange to see it suddenly appear in the middle of the movie. Remy is so cute,I’m in love with him.And he’s a rat.